Illgill head is the higher of the two fells that sit above the famous Wast Water Screes. Like so many of the fells in this part of the Lakes Illgill Head has an interesting rocky northern face and a smoother, rather less interesting southern face (this pattern is seen to best effect on the ridge between Ennerdale and Buttermere - the Ennerdale face is one long smooth slope from Starling Dodd to the top of the valley, the Buttermere face has three coves and plenty of crags). Illgill Head is at the north-eastern end of a ridge of high ground that starts at Irton Pike, and separates Wasdale and Miterdale. The ridge gains height as it runs north-east towards Whin Rigg, then stays above 1,500 feet for over two miles. From below Whin Rigg and Illgill Head appear to be one single long fell, and it is only when on the ridge itself that the two distinct summits become clear. Most of the impressive crags and the screes sit below the long grassy ridge that links Illgill Head to Whin Rigg, and there is an easy but rather dramatic walk that runs along the top of the crags (much better than the rather wetter path along the centre of the ridge). The main routes to the summit follow the ridge line - either heading north-east from Whin Rigg or south-west from Wasdale Head. When coming from Wasdale Head there are several alternatives - there are paths on either side of Straighthead Gill and another path that starts near the top of the pass between Wasdale and Burnmoor Tarn. It is also possible to climb the south-eastern slopes, starting at the upper reaches of the Mite and approaching the summit from the south-east. These slopes are steep (but not too steep), and mainly grassy with the odd rocky outcropping. Illgill Head had two summits on a larger summit plateau. The north-eastern summit is the higher of the two, while the south-western summit offers the best views out towards the coast. The best views of Wasdale can be found just to the north of the summit, on the far side of broken stone wall (don't go too far past the wall - there are crags below). This viewpoint is the real reason for visiting the summit. The lower reaches of Straighthead Gill form the north-eastern boundary of the fell, although the upper reaches belong entirely to Illgill Head. The eastern boundary is formed by nameless becks that flow south into Burnmoor Tarn. The southern boundary is formed by the River Mite as it flows south-west into Miterdale. The south-western boundary is formed by Great Grain Gill, which flows south-east into Robin Gill. The merged streams then form part of the boundary, running south-west into the Mite. Robin Gill is born just to the south of the summit, and runs south-east then south-west, splitting the bulk of Illgill Head from Tongue Moor. Little Grain Gill is also formed on the fell, flowing south into Robin Gill. There are no major becks on the north-western face of the fell, where the steep slopes and the screes dominate. 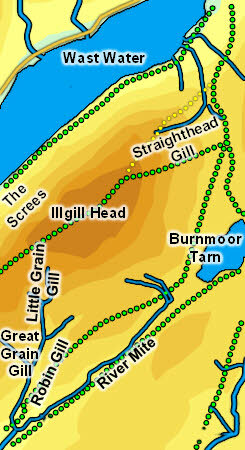 Illgill Head can claim part of Burnmoor Tarn, sharing it with Scafell, Great How and Boat How. There are also a number of small tarns between Illgill Head and Whin Rigg and smaller ones between the two summits. The most famous path on Illgill Head doesn't visit the summit, but is instead the path along the foot of the screes, a notoriously difficult route over shifting stones. It must be said I've seen more people on the top than on the scree path. The head of the River Mite is a fascinating place - a circular dell surrounded by low crags with waterfalls tumbling in from most sides.